Rudolph the rednosed reindeer – Harry Connick Jr. The river – Robert Downey Jr.
And if that didn’t teach me a lesson about being a little too confident, my self developed poppy seed Stollen turned out pretty weird looking (like exploded), on the brighter side, it did taste great. But this year’s absolute favorites were the chocolate coconut cubes. How so you think? Well, I had to make them four times and considering the yield of one batch, that’s quite impressive. Extremely yummy I find, so, by the way, do our neighbors! Anyhow, we wish you all very happy holidays, some deserved down time and of course many culinary highlights with the extra cookie! Preheat oven to 175°C (350°F). Line a baking dish/tin with parchment paper (mine is about 20×20 cm/8×8 inch). Combine butter, sugar and honey until foamy, then add the egg. Mix cocoa, flour and baking powder. Now add flour mix and milk and blend well. Pour the rather gooey dough in the prepared baking dish and evenly spread out using a knife or similar. It helps to occasionally dip the knife in cold water and the dough won’t be clinging as much to the knife. Bake for about 25 minutes, then check if it’s done by poking in a wooden skewer – it should come out quite dry and almost clean. Remove from the oven and let cool completely. Cut the cake into ~3x3cm (~1.2 x 1.2 inch) large pieces. Melt the chocolate in a bain-marie. Please see here for proper melting (tempering) instructions for chocolate or simply do it by guess and by gosh. The only possible drawback of not having the chocolate tempered would be a little less crisp chocolate coating. Prep time: 10min., baking: 25min., finishing: 20-30min. seeing what you have done,i would love to cook a hundred things for christmas, but it's not possible, you know. This year i had the idea of baking a stollen myself, i have reserved two recipes, but my mind stopped me by noting that the christmas pudding has enough raisins itself:) so on came tosca-buns! but it is true that traditions must be respected, even if only a bit. Well you've checked many more things off your list than I have off mine! I am so far behind this year, I don't know where the time went! Your cookies are gorgeous and the chocolate coconut cubes sounds amazing! I wish you a very merry Christmas and best wishes for the new year! very impressive list and these cubes sound decadent! Happy Holidays! 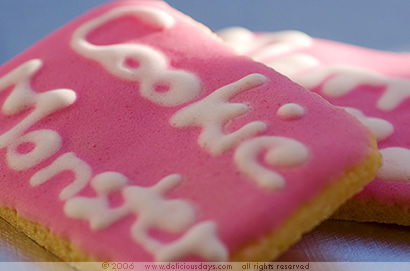 Another lovely sounding cookie recipe! I tried your blackberry smacks and unfortunately they are all already gone! So delicious! Merry Christmas to you! Oh please the recipe for the venison? Sounds so delicious! Thank you for another great post! Although I'm not that much into cooking, I like it very much to read your articles/recipes — and the pictures are great! Coconut and chocolate are two of my favorites, so I instantly bookmarked your recipe. Merry Christmas to you! Respekt, ganze sieben Stollen? Vielleicht fällt da auch noch einer für mich ab? Mohnstollen täte mich in jedem Fall auch interessieren, Deiner sieht doch ganz ok aus und wenn er dann auch noch schmeckt! 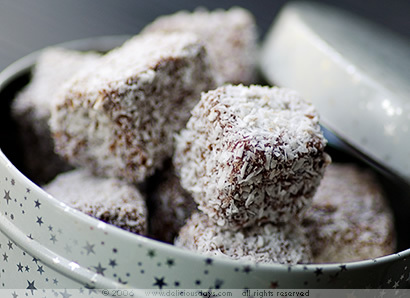 we call the last recipe (chocolate coconut squares) lamingtons. a very popular dessert in australian/new zealand. Absolutely amazing! I don't think I've ever seen such perfect icing! It's official, I'm addicted to your site! The recipes are fabulous, the stories are great, and the pictures are spectacular! How do you get such great close-ups, do you have a special camera? I'm in complete awe of what you put together with such apparent ease! Merry Belated Christmas & Happy New Year 2007! I know it's a bit late but here's wishing everyone a merry xmas and a happy new year. I recently returned from a holiday in Germany and I had a wonderful time. Reading this blog reminds me of all the fun I had. I spent 2 days in Munich and I loved the shopping, eating, sightseeing and the huge Marienplatz christmas market. I would love to return soon and spend a longer time to further explore this wonderful place! Janelle, The venison turned out incredible, the sauce was prepared with orange-juice and port. Unfortunately, we didn't take any pictures that evening, but I'm more than positive that we'll soon have venison again and the additional time to take pictures and write about it. I tried the chocolate cubes over the weekend and am sorry to report, that they are already gone! My two kids loved them! Since my husband is not very fond of coconut, I will try to roll them in chopped almonds the next time. Thank you for the recipe. 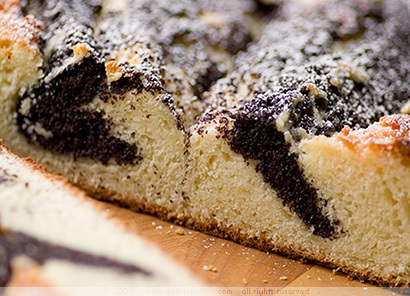 Dieser Blog ist super, wo find ich das Rezept für den poppy seed Stollen? Wow, i just found your blog and this is the first post i have seen and i must say - - I LOVE THIS BLOG ALREADY! After reading your christmas check list, it has really put me in the holiday spirit..just 4ish more months to go! Oh and i truly thing you need a little Michael Buble and Josh Groban added to that christmas iTunes playlist. truly. I've spent the last couple of weeks cooking and baking myself through your blog. And I say: these are also yummy - much like everything else I've tried. I used brown sugar by the way: made them less sweet and a little caramelly. Thanks for posting. Your playlist is almost identical to mine, I'll be trying the songs that I don't have on my list. The only song that you are missing is Blue Christmas, Elvis' version, it's a classic! I love this post, you've got me into the most christmassy mood I could ever be in October! Chocolate are my favorites, so I instantly bookmarked your recipe. Merry Christmas to you and your family. 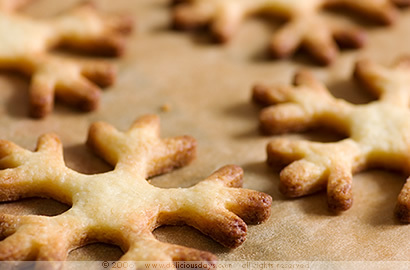 mein gott, wie bekommst du denn den guss so herrlich gleichmäßig auf die kristall-plätzchen? das sieht ja herrlich aus! -verrätst du mir den trick? for next year to add to your playlist: louis armstrong "christmas night in harlem" and greg lake "i believe in father christmas" - love your blog. 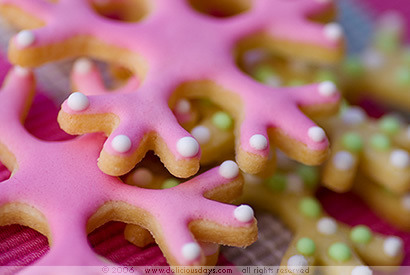 Is the pink snowflake cookie recipe on this site? I only see pics, but no recipe. Thanks.